– Place oil in a large pot on medimum heat. Add onion, fennel bulb, garlic, fennel seed, thyme and rosemary, cook for 5 minutes, stirring occasionally. 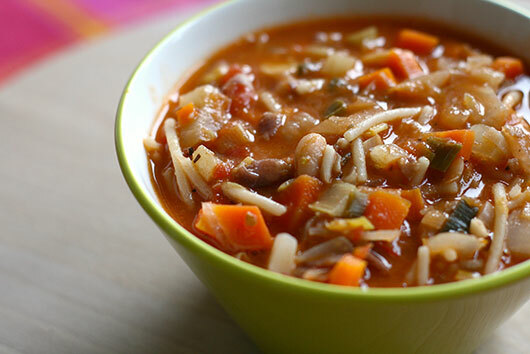 – Add filtered water or stock, tomatoes, beans, potato, celery, parsnip, carrot and squashes, cook until vegetables are just soft, approximately 25 minutes, stirring occasionally. – Add tomato paste, pasta & herbs and cook until pasta is done, approximately 10 minutes, stirring occasionally. – Top with additional nutritional yeast before serving. – Serve with Focaccia Bread cut into triangles. Baste with Basting Sauce and minced garlic while banking.